This is the login view, post entering the username and password it redirects user to the trip page. Now this page has huge amount of data. 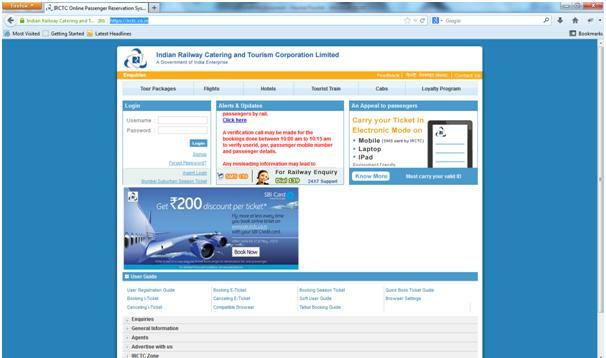 This page allows user to access railway ticket booking, air ticket booking, hotel bookings, tourist train information, cabs and customized tour packages from IRCTC. The system is very well developed but lacks at load sharing. That is only the aspect of this application needs to be improve. Locations are being suggested by entering only first four letters of location. Booking availability is being shown for 7 days. All the options for booking say for different class of coach are being shown at the same place along with their availability. The advantage of this application is as soon as you are done with your booking it immediately send a confirmation message and e-ticket to the registered mobile number and email address. This messages and e-tickets are being considered in absence of hard copy of ticket. This helps India in “Go GREEN” Concept. The another advantage of this application is that it has helped national and state government cut down the corruption, rising in ticket booking system. Just because of this system every single Indian citizen is turning less worried for their tour planning. Their time is saved using this application. Another Advantage this application has provided so far and will keep on providing is tour package booking, the statistics says this facility is mostly used by the foreign nationals who are on their India tour. They use this system to understand and explore India. What everyone requires is a perfect guidance to move around in India and this online service is the best option for the same. The other way around, pain area while travelling are the cabs and Hotel booking. Any layman can book the best services from this. The information along with their rates, services of class, packages if provided are made available on this. Every small item has been capitalized very well. Every booked item can be seen anytime in booking history. Printouts can also be taken. Reference can also be given. One more advantage of this application can be said is that anyone can file their TDR from this as well. Loyalty program on this website inspires users for the maximum utilization of this system, the benefits of this program also helps to save some amount of money also the gifting system attracts the new users.